19 August 2016. A genetics engineering team developed a technique for modifying the genome of E. coli bacteria to remove redundant DNA components, a step toward designing new organisms. The team led by Harvard Medical School geneticist George Church and University of Washington postdoctoral researcher Marc Lajoie published its findings yesterday in the journal Science (paid subscription required). Church, Lajoie, and colleagues are seeking a technology for synthesizing substances not easily produced from nature, such as pharmaceuticals and chemicals, by harnessing processes in organisms, in this case E. coli, with genetic codes altered to produce those substances. Escherichia coli is best known as a bacteria causing intestinal infections, although most types of E. coli are harmless. Because E. coli is a well-studied bacteria, it is often used as a model for higher-order organisms. The researchers at this stage looked for redundancies in the bacteria’s genetic code that could be eliminated without impairing its functionality. In earlier research, Church and Lajoie showed the feasibility of DNA components called codons to be replaced. Codons are sequences of three DNA molecules that correspond to specific amino acids in the production of proteins. In their new study, the authors applied this technique to the overall E. coli genome. The task required the team to build many of their own tools from scratch, including rules-based software for testing the feasibility of identifying and replacing redundant codons in a way that still enables the organism to function. Because E. coli bacteria are a well-understood organism, a detailed template for the genome was available. 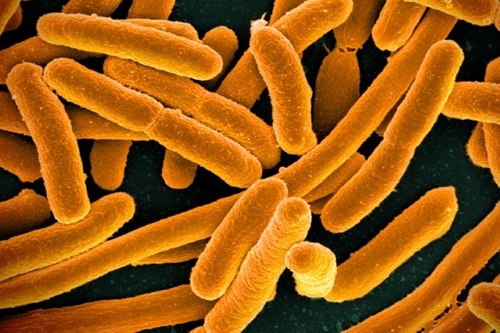 The researchers identified 7 of the 64 codons in the E. coli genome as replacement candidates. Algorithms in the software tested the presence of the 7 codons throughout the genome, identifying more than 62,000 instances where they occur, and replacing the codons with synonymous alternatives in all E. coli genes that produce proteins. The authors called on 4 companies to synthesize E. coli DNA with the 57 rather than full 64 codons: Gen9 in Cambridge, Massachusetts, Twist Bioscience in San Francisco, Genewiz in South Plainfield, New Jersey, and Integrated DNA Technologies in Coralville, Iowa. The synthesized DNA was then amplified with polymerase chain reaction and assembled with a genetic assembly system from Life Technologies in Carlsbad, California. The team so far tested and validated 63 percent of the recoded genes, and found 91 percent of the genes tested retain their functionality. The investigation also turned up 13 lethal exceptions in 2,229 genes. The researchers say their findings show the feasibility of synthetic genome construction, which the authors estimate costs under $1 million, even with software development included. Harvard University applied for a patent on the processes developed for rules-based genome design. In addition to his academic research, Church is a serial entrepreneur and a founder of Gen 9 Inc., one of the companies called on to produce synthetic DNA for the project. Gen9 provides customized gene synthesis and is developing a library of synthesized proteins and antibodies. Church is also a founder of Enevolv Inc. in Boston, a provider of synthesized microbes for production of pharmaceutical, nutrition, energy, and specialty chemical products.